OCEARCH is watching closely as a large female white shark named Miss Costa cruises off the coast of the Florida Panhandle south of Panama City. She first pinged this year in the Gulf of Mexico in mid March and has been working her way steadily north ever since. Miss Costa was 12 feet 5 inches long when she was tagged in 2016 off the coast of Nantucket, MA and could be between 14 and 15 feet long today. Her trip to the Florida Panhandle is significant because OCEARCH doesn’t often track large white sharks that far north into the Gulf, especially big females. 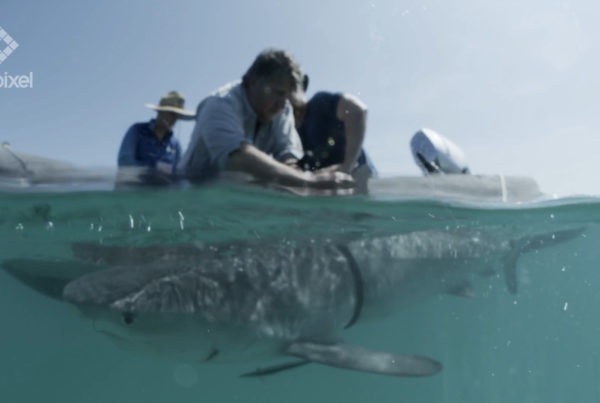 It’s been known for a long time that white sharks visit the Gulf of Mexico, but the majority of their activity there remains a mystery since data sets on their movements in the region are lacking compared to other areas in the Northwest Atlantic. Earlier this year, OCEARCH tracked white sharks Nova and Cabot into the Gulf, but their tracks stuck pretty close to the Florida Keys. 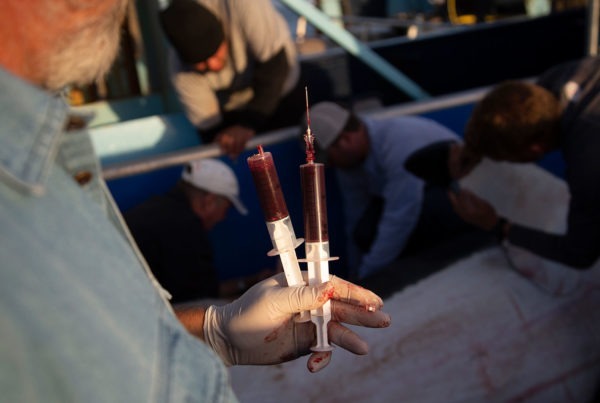 There are also reports from February of this year that fishermen on a pier in Pensacola, FL hooked a white shark. Tracking data OCEARCH started collecting in 2012 shows white sharks can be found in the Gulf of Mexico for at least six months out of the year. Data on the OCEARCH Tracker shows the apex predators there as early as December and as late as July. Most of the pings are over the continental shelf west of Florida. Now Miss Costa’s new tracks can help us start adding more depth to our understanding of white shark movements in the Gulf. Her trip this year is similar to a foray she made into the Gulf in January of 2018. This year’s trip also matches up almost exactly to the timing of white shark Hilton’s visit to the same area in 2018. Hilton, a mature male, laid down the closest tracks to the Panhandle that OCEARCH has ever collected. He also visited the DeSoto Canyon, a productive fishing area south of Pensacola that Miss Costa could visit this year. Miss Costa’s visit is also significant because OCEARCH has only ever tracked two other large females into the Gulf of Mexico. White shark Katharine is one of those two sharks and was on the cusp of reaching maturity during her tagging at the end of 2013. 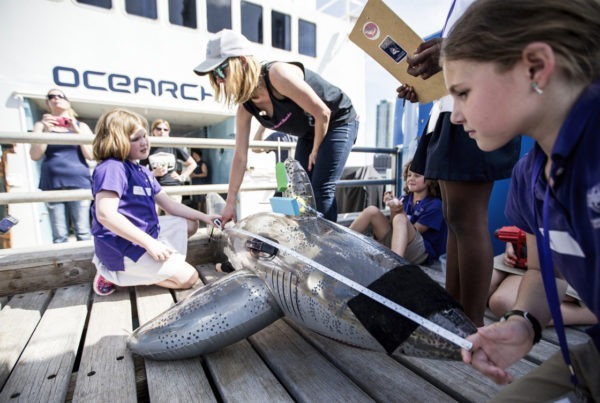 Katharine only visited the Gulf during the first year she was tracked in 2014. Instead of returning to the Gulf, in 2015 she started making wide sweeping loops out into the open ocean. OCEARCH hypothesized that between 2014 and 2015 she reached adulthood and became pregnant, causing her to change her migration. We suspect Miss Costa is about the same age as Katharine was when she made a big shift in her migration. Miss Costa’s behavior in this region will provide valuable data to test our hypothesis regarding the migration patterns of adult female white sharks in the North West Atlantic Ocean. Miss Costa is named after OCEARCH’s partner Costa Sunglasses. 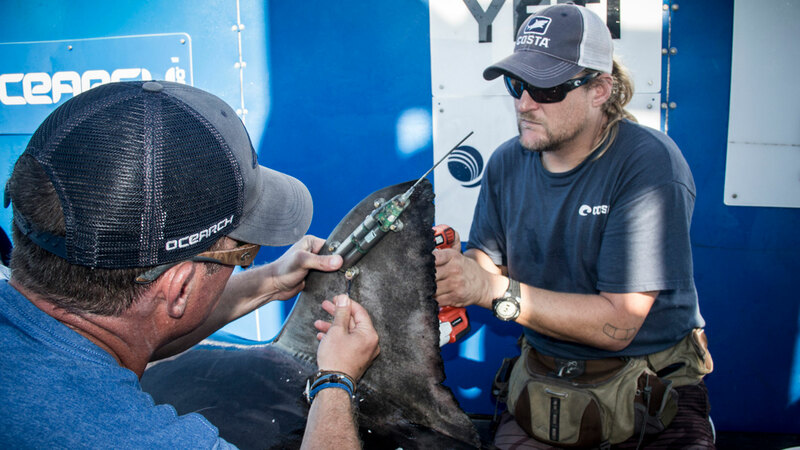 Costa support over the years has helped to fund expeditions around the world and OCEARCH is incredibly thankful for their support. Get the latest tracker updates, giveaways, and events sent direct to your inbox.